Nearly a million minutes of video content per second. That’s what industry experts are predicting will cross IP networks by 2021! 71% of all internet video traffic will cross over CDNs. And thats why colocation for the media and entertainment industry is becoming even more important. As these predictions become reality, Media & Entertainment (M&E) organizations may find themselves in a tight spot. How do you distribute content effectively across every channel? How do you keep up with enormous demand? How do you empower your creatives to do their best work? How do you streamline the supply chain to maximize efficiency and security? How do you provide the best possible user experience? M&E companies face unique challenges that many businesses never see, including a mind-boggling volume of content, data transfer bottlenecks that can arise at any point from pre-production to delivery, the huge amount of compute capacity required for rendering, and the costs associated with staying ahead of the IT curve. Colocation for the media and entertainment industry is set up to solve these challenges. One approach successful M&E companies are taking is to centralize their workflows in a high-density, low-latency hybrid cloud environment. This cost-effective approach can streamline data movement, increase performance, and reduce security risks. Colocation can help you achieve that and more, housing the entire ecosystem in a single data center for maximum efficiency and competitive advantage. 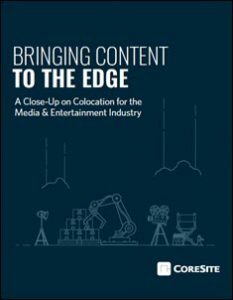 Download the new white paper, courtesy of CoreSite, that explores how an advanced colocation provider can set media and entertainment companies up for success.